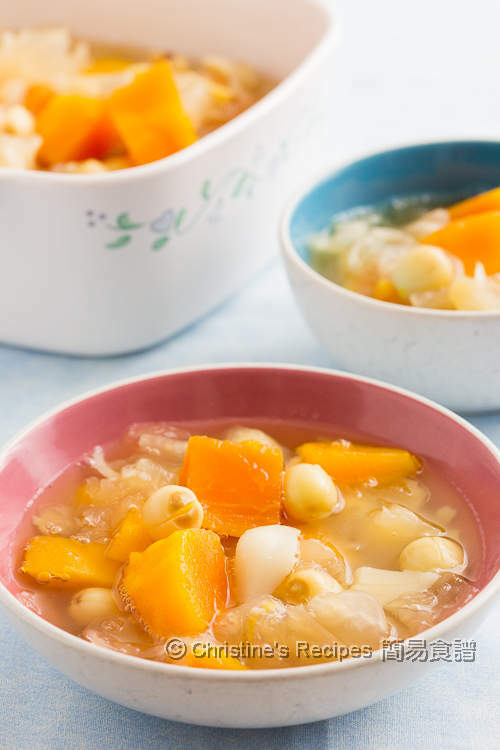 I grew up with this traditional Chinese dessert, Snow Fungus and Papaya dessert Soup. You still can find it in some Hong Kong dessert restaurants or Chinese Dim Sum restaurants. This dessert dish is very delicious and will bring an amazingly soothing and nourishing effect on our body. Snow fungus has many different names, like white fungus, silver ear, snow ear or silver ear fungus, 雪耳/銀耳 in Chinese. Snow fungus is just like other kinds of edible fungus, tasteless on its own. Its smooth and gelatinous texture after boiled is quite nice though. Snow fungus contains dietary fibre and helps lower cholesterol and keep our skin look younger. To make this dessert, it’s very simple. 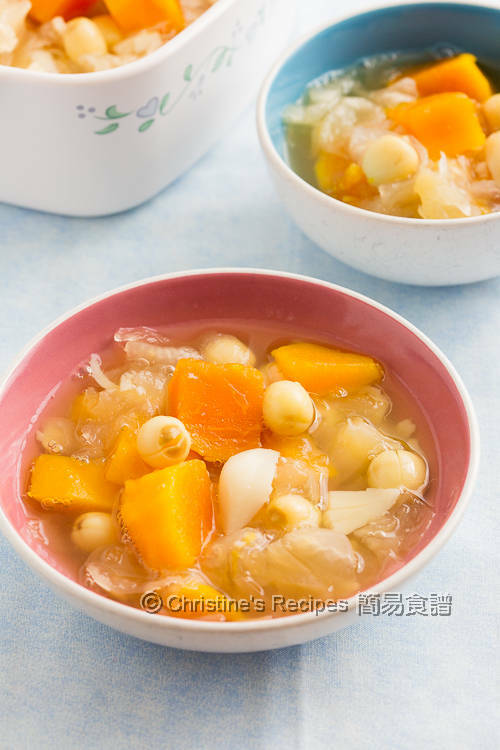 Soak snow fungus and lotus seeds until softened. 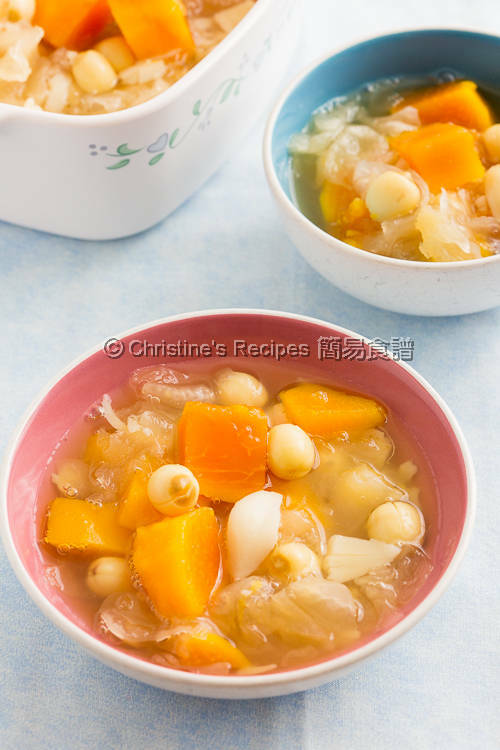 Cook the lotus seeds first as they need longer cooking time, then followed by snow fungus. Lastly add the papaya and sugar. When it comes to making this dessert, I prefer papaya (red flesh) to pawpaw (yellow flesh) as the flesh of papaya is sweeter. The red flesh of papaya looks so attractive with the white lotus seeds mingled with the semi-transparent snow fungus. This dessert is commonly served after dinner. It could be served hot or after chilling. 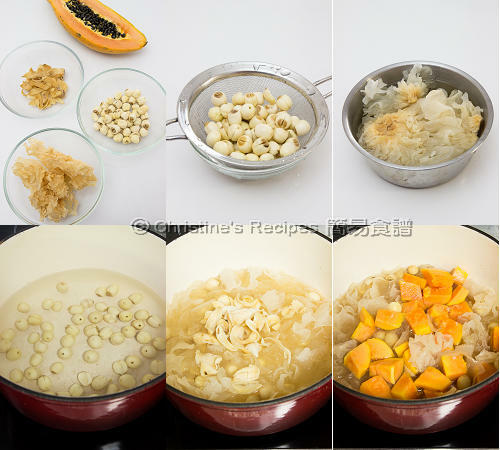 Rinse the lotus seeds, snow fungus and dried lily bulbs. Drain well. Soak them in water separately. Lotus seeds need soaking in water at least 3 hours, or overnight. Snow fungus and dried lily bulbs only need soaking for 30 minutes or so. Use a knife or a pair of scissors to trim away the yellow hard ends. Cut into smaller pieces. Set aside. In a large deep pot, pour in the water. Bring it to boil over high heat. Add white lotus seeds. Reduce heat to medium-low. Cook until softened, about 30 minutes. Increase heat to high. Add white fungus and lily bulbs. When it boils again, reduce heat to medium low. Continue to cook about 30 minutes. Add papaya and rock sugar. Cook until the sugar is completely dissolved. Serve hot or cold. You can easily find dried snow fungus at any Asian grocers. Either papaya (red flesh) or pawpaw (yellow flesh) will work for this recipe. I chose papaya as its flesh is sweeter than pawpaw. The amount of sugar can be adjusted to your taste, and depends on how sweet your pawpaw is. After soaking the white lotus seeds, you can easily remove the cores inside the seeds. Use a toothpick or needle to poke them out one by one. Otherwise your soup will taste bitter. As the power of every stove is very different, adjust the cooking time accordingly. Replenish boiling water if you find the soup boiled away too quickly. One must have during the hot humid summer days!